08/27/2003 - Current OSHA initiatives to improve quality of chemical hazard information provided to workers. Title: 08/27/2003 - Current OSHA initiatives to improve quality of chemical hazard information provided to workers. Thank you for your letter of June 27, 2003, regarding the Occupational Safety and Health Administration's (OSHA) Hazard Communication Standard (HCS). In your letter, you requested a report on the findings of the review of material safety data sheet (MSDS) requirements being conducted by the Agency. This review is currently underway, and OSHA has agreed to complete the process by the end of this year. Although work remains to be done, the Agency's efforts thus far allow some preliminary conclusions to be drawn. Progress is also continuing on a number of initiatives that OSHA has undertaken to enhance the quality of hazard information provided to employees through MSDSs, labels, and training. 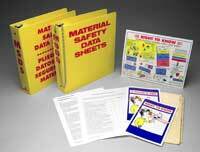 These handy MSDS binder training inserts and other OSHA compliance materials are available at Safety Emporium. OSHA has examined reports produced by the Chemical Safety and Hazard Investigation Board (CSB) concerning four incidents involving reactive chemicals. Each of these reports mentions MSDSs in relation to the incident subject to investigation. In no case was the inaccuracy of an MSDS listed as a root or contributing cause of an incident. OSHA cited one of the employers involved for inaccurate MSDS information. In the other cases, OSHA had questions about the evidence regarding the accuracy of the MSDS involved. OSHA recognizes the need for improving the quality of chemical hazard information provided to workers. The HCS requires MSDSs to be accurate and complete. As you noted, the MSDSs are actually prepared by chemical manufacturers and employers rather than by the Agency. The qualifications of chemical manufacturers and employers writing the MSDSs varies, and this has an impact on the quality of the MSDSs produced. In addition, the availability of information also varies considerably on different chemicals. Dealing with mixtures of chemicals presents certain difficulties as well, and the science continues to evolve with regard to certain types of hazards as well as various protective measures. All of these factors contribute to the complexity of developing an accurate and complete MSDS. The Agency's interests are not limited to MSDSs. MSDSs are only one component of a comprehensive hazard communication program. MSDSs are intended to provide detailed technical information and serve as a reference source for workers, emergency responders, health professionals, and other interested parties. 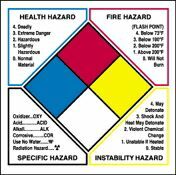 Labels are intended to provide a brief, conspicuous summary of hazard information at the site where the chemical is used. Training is designed to ensure that workers understand chemical hazards in their workplace and are aware of protective measures to follow. MSDSs, labels, and training are complementary parts of a comprehensive hazard communication program - each element reinforces the knowledge necessary for effective protection of workers. When a lack of knowledge of chemical hazards results in an incident that threatens the health or safety of workers, OSHA considers the hazard communication program as a whole, rather than MSDSs exclusively. Therefore, while MSDSs are the focus of the Agency's current review, OSHA intends to pursue initiatives designed to strengthen all elements of hazard communication programs. Guidance for Hazard Determination. The HCS requires that manufacturers and importers of chemicals evaluate available scientific evidence in order to identify physical or health hazards associated with any chemical they manufacture or import. This process is referred to as a hazard determination. The hazard determination provides the basis for the hazard information that is provided in MSDSs, on labels, and during worker training. The intent of this document is to provide guidance on the process involved, and to identify considerations to be taken into account in the conduct of hazard determinations. Following this guidance should help preparers of MSDSs and labels ensure that the information they provide is complete and accurate. Guidance for Preparation of MSDSs. MSDSs are intended to furnish detailed information regarding chemical hazards, as well as protective measures that are available. This document will provide guidance on how to write MSDSs that are clear, consistent, and comprehensive. It includes a recommended MSDS format, as well as instructions for composing individual sections of the MSDS. Sources that can be consulted to obtain information to complete the sections are indicated, as well as guidance on what type of information to include in each section. There are also some suggestions for ensuring that the information is presented in a comprehensible manner. This document should help to address both the accuracy and the comprehensibility of MSDSs. Model Training Program for Hazard Communication. Employers are required by the HCS to provide training to employees who are exposed to hazardous chemicals. Effective training is needed to explain and reinforce the information presented on labels and MSDSs. This document is designed to assist employers in developing a training program that is tailored to the needs of their workplace, regardless of size or complexity. These documents will be made available in draft form for public comment in the near future. OSHA has also focused on development of the Globally Harmonized System of Classification and Labeling of Chemicals (GHS) as an avenue for improving chemical hazard communication. The Agency believes that the GHS has the potential to serve as a mechanism for addressing many of the concerns that have been raised regarding the comprehensibility of chemical hazard information. The GHS is the result of a 10-year effort to establish international consensus on criteria for classifying chemicals according to their hazards, and to create consistent requirements for labels and safety data sheets. The GHS draws upon the experience of a number of countries and organizations that have developed regulations requiring information to be prepared and transmitted to downstream chemical users, and OSHA was extensively involved in the development process. The GHS was formally adopted by the United Nations in December 2002. The GHS is intended to accomplish a number of objectives. A major goal is to improve the quality and consistency of chemical hazard information. It is also anticipated that the GHS, if implemented, will facilitate international trade in chemicals, reduce the need for chemical testing and evaluation, and provide a recognized framework for those countries without an existing hazard communication system. In addition to criteria for classifying chemicals according to their health, environmental and physical hazards, the GHS includes standardized requirements for labels and safety data sheets. A standardized 16-section format is established for safety data sheets, to provide a consistent sequence for presentation of information. Items of common interest to workers are presented at the front of the document, while more technical information is presented later. Headings for the sections (e.g., First Aid Measures, Handling & Storage) are standardized to facilitate locating information of interest. The GHS also establishes standardized and more detailed requirements for labels, including consistent use of pictograms (e.g., skull and crossbones), signal words (e.g., Danger), and hazard warning statements (e.g., Fatal if Swallowed). Standardization may also increase the accuracy of chemical hazard information. With consistent presentation of information, the task of reviewing safety data sheets and labels to assure accuracy is simplified. Individuals preparing and reviewing these documents should find it easier to identify any missing elements, and OSHA enforcement personnel should be able to more efficiently examine safety data sheets and labels when conducting inspections. OSHA has compared the GHS requirements with the current requirements of the HCS in order to determine what changes would be involved if current regulatory requirements for chemical hazard information are revised to conform to the GHS. A document summarizing and explaining the GHS is also under development by the Agency to assist in considering adoption of the GHS in the U.S.
OSHA is also working on development of an Alliance with the Society for Chemical Hazard Communication (SCHC). SCHC is a professional society organized to promote the improvement of chemical hazard communication, and includes over 600 members representing a wide range of industries, academia, and government. OSHA and SCHC are exploring options for improving the presentation and content of MSDSs by offering a course to instruct individuals responsible for the preparation of MSDSs. Such a course could be designed to accommodate the needs of small businesses and could be presented at various locations throughout the country. I would be happy to arrange for members of my staff to meet with your staff to discuss any of these initiatives further or to discuss other issues related to hazard communication. I hope this information is useful, and I look forward to continuing to work with you to better protect America's workers. Entry last updated: Friday, July 8, 2016. This hypermarked and content-enhanced page is copyright 2001-2019 by ILPI, all rights reserved. Unauthorized duplication or posting on other web sites is expressly prohibited. For questions, comments and concerns, please contact us at our MSDS email address.